Subscribe to get all the juicy details in your inbox! 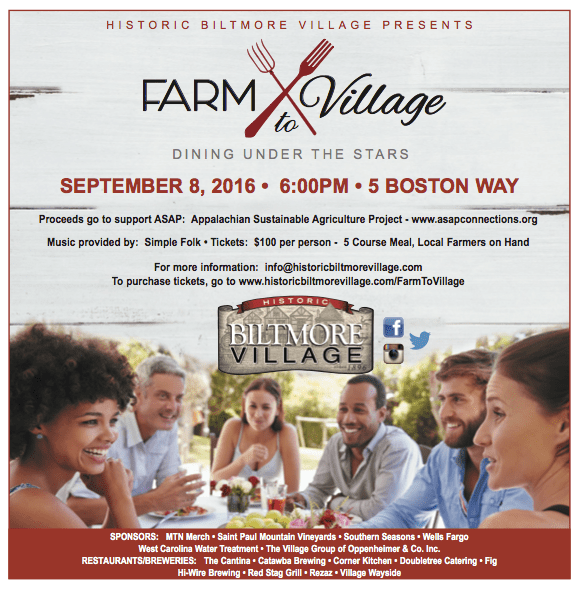 On September 8 at 6pm, restaurants and breweries in Historic Biltmore Village will come together on 5 Boston Way for a fundraiser to support the Appalachian Sustainable Agriculture Project. Guests will have a chance to meet and mingle with award winning chefs, brew masters, local farmers and a vineyard owner. Local band, Simple Folk, will entertain guests with their dulcet sound and pleasing melodies while they dine on create a 5-course gourmet dinner under the stars. ASAP works diligently to promote local farms and this event will feature fresh produce and meats supplied by the farms they support. The meal will feature amazing dishes from Biltmore Village partners The Cantina, Catawba Brewing, Corner Kitchen, Doubletree Catering, Fig, Hi-Wire Brewing, Red Stag Grill, Rezaz and The Village Wayside. The event is sponsored by MTN Merch, Saint Paul Mountain Vineyard, Southern Season, West Carolina Water Treatment, Wells Fargo, and The Village Group of Oppenheimer and Co. Inc.
Tickets are limited to the first 100 who sign up and are $100 per person. Purchase a ticket and enjoy tasty food, wine and craft beer and take home a gift bag at the end of the evening. You can also find more information at www.historicbiltmorevillage.com/events and www.asapconnections.org/farmtovillage. Located directly across from the world famous Biltmore Estate, The Historic Biltmore Village is truly one of the south’s most unique touring and shopping environments. The Village features a collection of independent, regional and national retailers along with the most sought after restaurants and outstanding lodging. It’s the perfect night out for foodies, brews and friends. It’s a must see site for history buffs and architecture aficionados. In short, it’s a destination like no other. Appalachian Sustainable Agriculture Project is a 501C (3) Non-profit organization whose mission is to help local farms thrive, link farmers to markets and supporters, and build healthy communities through connections to local food. Lisa M Frame is over-achieving Southern gal with a knack for Pinterest and making people laugh. She writes about life, food, culture and travel and reads bad fiction. Lisa Frame is an over-achieving Southern gal with a knack for Pinterest and making people laugh. She writes about life, food, culture and travel. Lisa is a very amateur photographer, voracious reader, wanna-be neat freak, and closeted crafter. Lisa is a lifestyle blogger, writer and social media strategist living in Charlotte, NC.